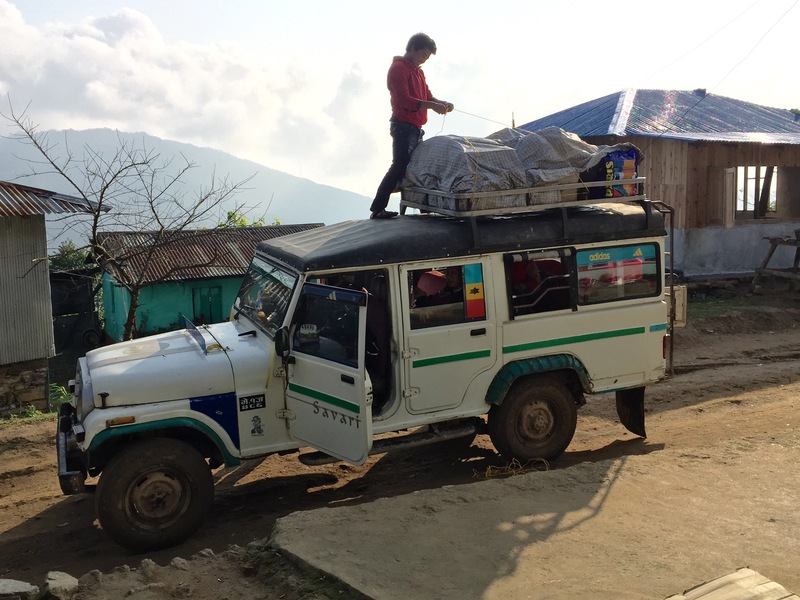 Americans who complain about potholes in their roads should take a ride on one of the taxis that serve Samulbung, a village in eastern Nepal. These four-wheelers climb and swerve along unpaved roads made of potholes. They bounce over cobblestones along the better stretches, then struggle across longer stretches where the pockmarked dirt often becomes mud. During the monsoon season, the mud resembles a swamp. Even when rain is intermittent, as it was when we visited a few days ago, water collects into pools. Drivers have to place one tire on either side of a pool and avoid slipping into the middle, or else charge through and try to reach the other side before losing traction. Sometimes the driver doesn’t make it. That’s what happened when our driver, Arpan, was a split-second late in down-shifting over a depression in the road. Since his four-wheel-drive was temporarily broken, he swerved into a ditch, as shown in the photo, then nearly burned off his left rear tire trying to regain contact. We all had to get out as he and his assistant gathered stones and gravel to provide traction. Eventually we got back on the road. Tires puncture regularly, which also happened to us. 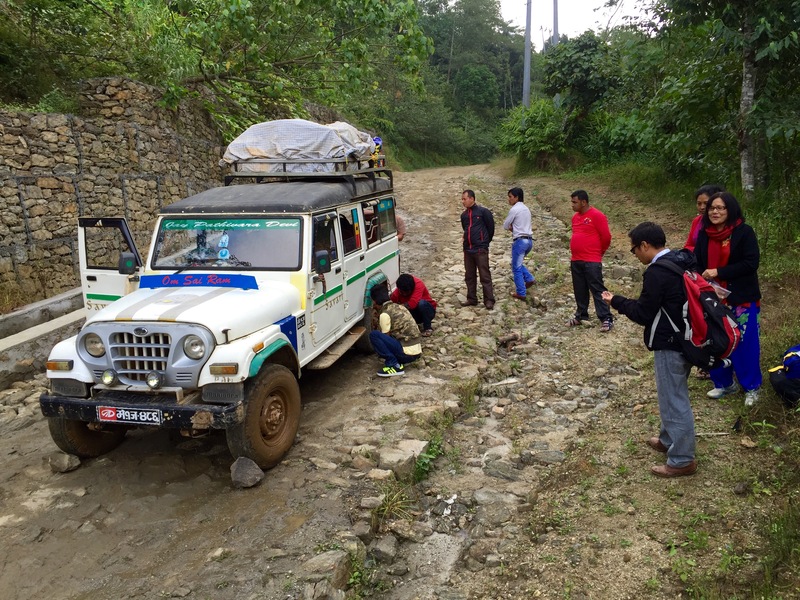 Once again, we disembarked as Arpan and his assistant made a quick roadside repair, as you can see here. Such repairs provide a break from a journey that routinely steers to the edge of precarious roads lacking side barriers. If the vehicle went over the edge, it might fall hundreds of feet before crashing amid the world’s biggest mountains. Keep in mind there is no Life Flight helicopter service here. For that matter, there are hardly any doctors. 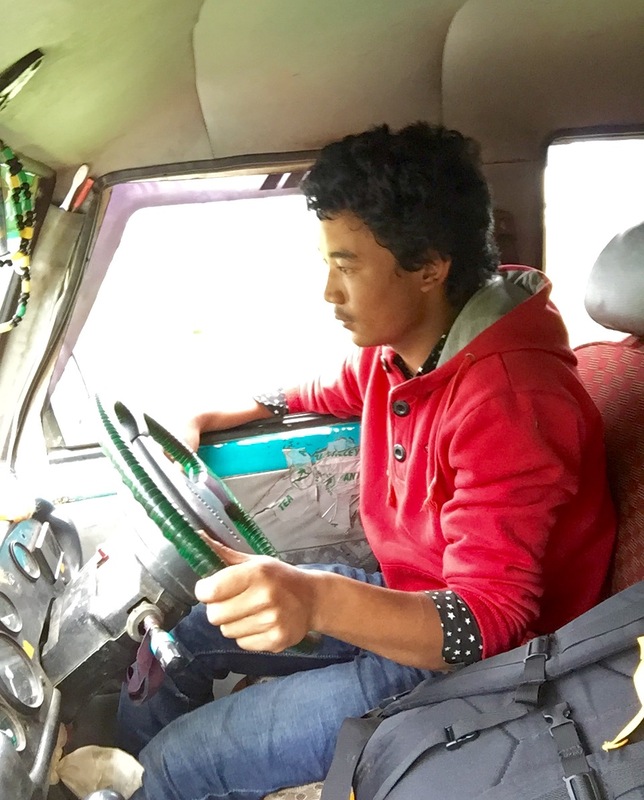 Many of the drivers are young men, who remain cheerful despite working long hours and earning little money. 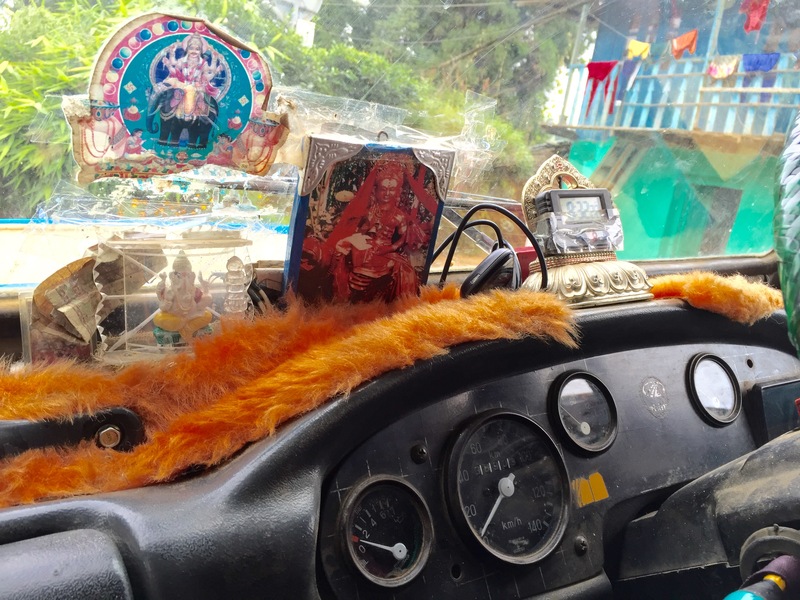 They stop regularly to pick up passengers and goods, and also to run errands — such as delivering a cell phone or money — for people along the route. Champa and I took two trips and found them simultaneously terrifying and hilarious. 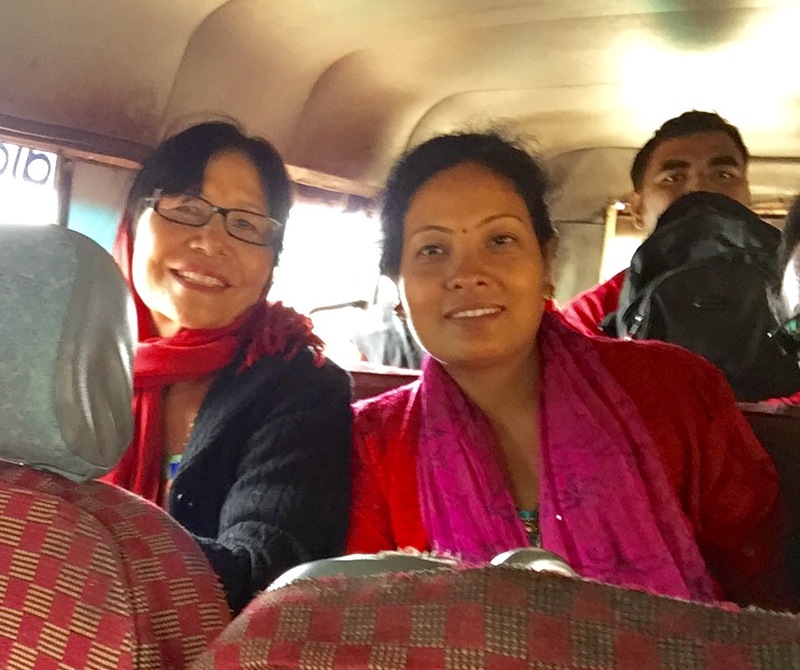 As happens so often in Nepal, we soon got used to the situation and begin joking with the other passengers at each new unexpected turn. 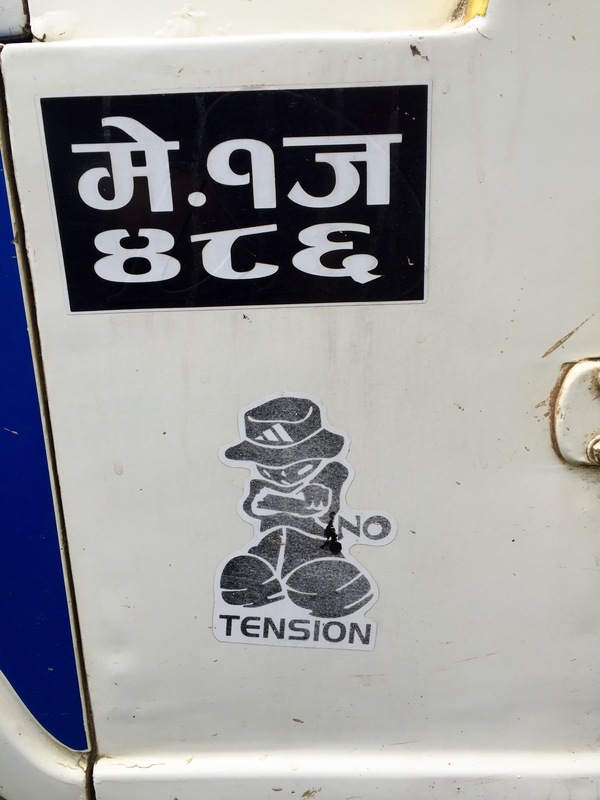 We embraced the “No Tension” sticker on the driver’s door. Our fare for four passengers to travel three hours to Fikkal, the local town, was $11, luggage included. If you find that price unbelievable, well, you’re right: It’s not what you’d expect. We paid nearly double the usual fare to ensure we had only one person in the front passenger seat (me) and only three in the second row. Champa and Bindu, shown here, shared the second row with Bindu’s husband, our nephew Shankar. Business class rocks. Your adventure reminds me of over-packed vehicles, and way too many passengers, traveling the uneven mountains roads of Guatemala! 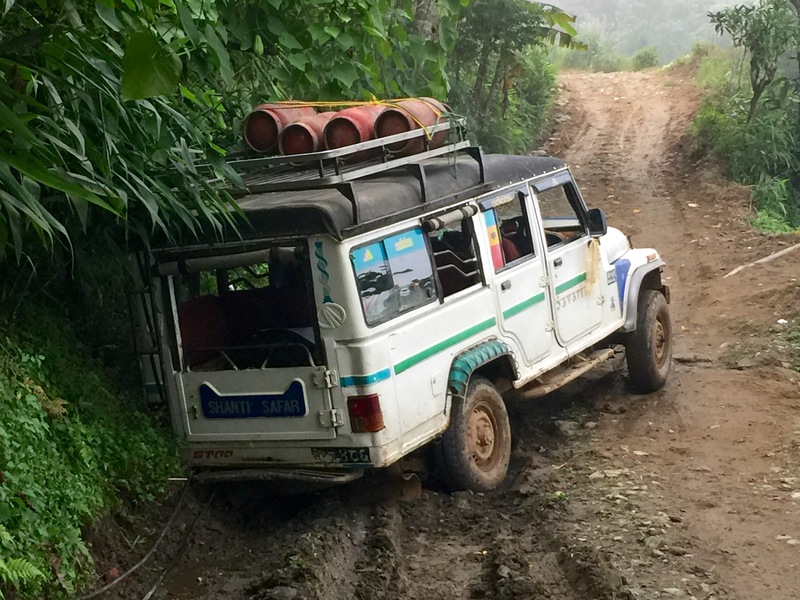 In Sierra Leone, the roads can be very primitive into villages but the mountains are not nearly as high! Still as you stated, once you get over being terrified, then you can cope! May you continue safe travels! I am enjoying your updates so much! Safe travels!